To hear the many languages of New York, just board the subway. The number 7 line, which leads from Flushing in Queens to Times Square in the heart of Manhattan takes you on a journey which would thrill the heart of a linguistic anthropologist. Each stop along the line takes you into a different linguistic universe - Korean, Chinese, Spanish, Bengali, Gujarati, Nepali. And it is not just the language spoken on the streets that changes. Street signs and business names are also transformed, even those advertising the services of major multinational banks or hotel chains. In the subway, the information signs warning passengers to avoid the electrified rails are written in seven different languages. But as I have discovered, New York is not just a city where many languages live, it is also a place where languages go to die, the final destination for the last speakers of some of the planet's most critically endangered speech forms. Of the world's around 6,500 languages, UNESCO believe that up to half are critically endangered and may pass out of use before the end of this century. Immediately we think of remote Himalayan valleys or the highlands of Papua New Guinea, bucolic rural villages where little known languages are still spoken by handfuls of speakers. But languages can die on the 26th floor of skyscrapers too. New York City is one of the most linguistically rich locations on earth, the perfect location to conduct research on endangered languages. A recent Census Bureau report notes that in the United States, the number of people speaking a language other than English at home increased by 140% over the last 30 years, with at least 303 languages recorded in this category. Originally home to the indigenous Lenape people, then settled by the Dutch, conquered by the English and populated by waves of migrants from every country ever since, the five boroughs that make up the Big Apple - The Bronx, Brooklyn, Manhattan, Queens, and Staten Island - are home to every major world language, but also countless vanishing voices, many of which have just a few remaining speakers. No longer do aspiring field linguists have to trek halfway across the world to collect data on Zaghawa or Livonian, they can just take the Number 7 train a few stops where they will find speakers of some of the 800 languages that experts believe are spoken in New York. I did just that, getting out at Jackson Heights, to visit a young family I knew well from Nepal. They live in a massive apartment block, which, judging by the names on the letterboxes, housed speakers of at least 40 languages. Every household in their home village in Nepal, high in a mountains a few miles from the Tibetan border, has a son or daughter working in New York. And they have recreated the sense of a Himalayan village in this new land - they all live within a few blocks of each other and meet regularly for children's birthdays or to play cards, chatting away in their endangered language, a form of speech known simply as village language. And not only that - head of the family Wangdi has also picked up Chinese and Spanish from working in New York's sandwich bars and restaurants. His son Sonam, now only one year old, already hears three languages at home. He will probably grow up speaking four. The only common language spoken in the apartment block? "English." When there is an important Buddhist ritual to be performed, someone in New York records it on a smart phone and immediately posts it online so that grandma and grandpa back in Nepal can watch and participate too. Recognising what a unique opportunity New York provided, two linguists and a performance poet - Daniel Kaufman, Juliette Blevins and Bob Holman - set up the Endangered Language Alliance, an urban initiative for endangered language research and conservation. 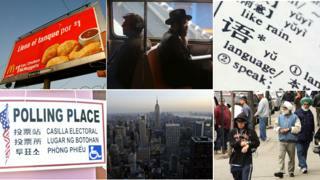 "This is the city with the highest linguistic density in the world and that is mostly because the city draws large numbers of immigrants in almost equal parts from all over the globe - that is unique to New York," says Kaufman. Several languages have been uttered for the very last time in New York, he says. "There are these communities that are completely gone in their homeland. One of them, the Gottscheers, is a community of Germanic people who were living in Slovenia, and they were isolated from the rest of the Germanic populations. "They were surrounded by Slavic speakers for several hundreds of years so they really have their own variety [of language] which is now unintelligible to other German speakers." The last speakers of this language have ended up in Queens, he says, and this has happened to many other communities. Garifuna is an Arawakan language from Honduras and Belize, but also spoken by a diaspora in the United States. Staff at the Endangered Language Alliance have been working with two Garifuna speakers, Loreida Guity and Alex Colon, to document not only their language but also aspects of their culture through traditional song, before these are lost without record. Urban linguists have also shot video of Husni Husain speaking Mamuju, his Austronesian language from Sulawesi, Indonesia. He may be the only Mamuju speaker in New York, and these recordings are probably the first ever digital documents of his language being spoken. But why do languages die? Communities can be wiped out through wars, disease or natural disasters, and take their languages with them when they go. More commonly, though, people transition out of one mother tongue into another, either by choice or under duress, a process that linguists refer to as language shift. Being one of the last speakers of a language is a lonely place to be - you may have no one to talk to, no way to write it down and all kinds of cultural and historical knowledge that does not translate easily into English, Spanish or another more dominant language. Languages ebb and flow, some triumph for a while only to fade away. At the end of 19th Century, the lower east side of Manhattan was a celebrated centre of European Jewish culture, a world of Yiddish theatre, newspapers, restaurants and bookshops. But in the 20th century, Yiddish took a battering as the Jewish community left the lower east side and moved out to the suburbs. The American-born children of Jewish immigrants understood, but rarely spoke, Yiddish. With no readership, newspapers closed and books were discarded. And then, just as it was most threatened, Yiddish bounced back, thanks to an unusual combination of technology, faith and the efforts of Aaron Lansky, founder and president of the Yiddish Book Center. He established the centre to help salvage Yiddish language publications, 11,000 of which have now been digitised and are freely available online. Yiddish also found support from an unexpected quarter - while secular Jews were increasingly giving up the language in favour of English, religious Jewish communities across New York continued to speak it, using Yiddish as their everyday vernacular allowing Hebrew to be reserved for religious study. "There are many people nowadays who take Yiddish very seriously and raise their kids in Yiddish as well," says Lansky. "The resurgence of interest in Yiddish is certainly not a nostalgic enterprise. If anything I think it is really a serious attempt to understand a broader view of Jewish identity and it is only now that young people are engaging with that." Even Yiddish radio, once ubiquitous in New York, has made a comeback thanks to technology, with a once-a-week show produced by staff at a Jewish newspaper. New York is a city that never sleeps and a city that never stops talking - a churning metropolis in which businesses, buildings and people are buffered by the changing winds of commerce and culture. It is the perfect vantage point to listen to how the world's languages rise and fall on the tides of human affairs. I wonder in how many languages can you say 'Big Apple'?